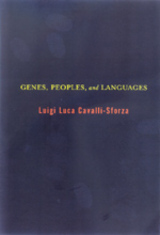 Luigi Luca Cavalli-Sforza was among the first to ask whether the genes of modern populations contain a historical record of the human species. Cavalli-Sforza and others have answered this question—anticipated by Darwin—with a decisive yes. Genes, Peoples, and Languages comprises five lectures that serve as a summation of the author's work over several decades, the goal of which has been nothing less than tracking the past hundred thousand years of human evolution. Cavalli-Sforza raises questions that have serious political, social, and scientific import: When and where did we evolve? How have human societies spread across the continents? How have cultural innovations affected the growth and spread of populations? What is the connection between genes and languages? Always provocative and often astonishing, Cavalli-Sforza explains why there is no genetic basis for racial classification. Luigi Luca Cavalli-Sforza was born in Genoa in 1922 and has taught at the Universities of Cambridge, Parma, and Pavia. He is currently Professor Emeritus of Genetics at Stanford University and is the author of The History and Geography of Human Genes.